Princess Emma and Princess Abby get dressed up just right for their special day in this level-one story. When their guests arrive in their beautiful dresses, Emma can’t find her friend Beth, who has headed home because her dress is too plain for the royal party. Will Emma find a way to help Beth? This level-one story teaches girls what it means to be a princess for the true King. A lesson in kindness. 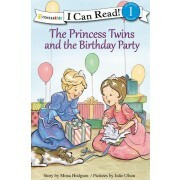 The Princess Twins and the Birthday Party is A Lesson in Kindness, especially appeals to ages 4-7.